With the increasing affluence of the average Singaporean, travel is something that has become a staple of many Singaporean’s annual schedule. 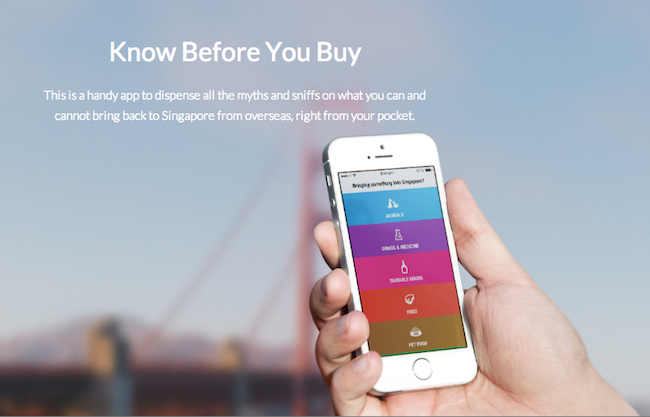 And what’s one thing Singaporeans love to do when they travel? Shop and eat, of course! 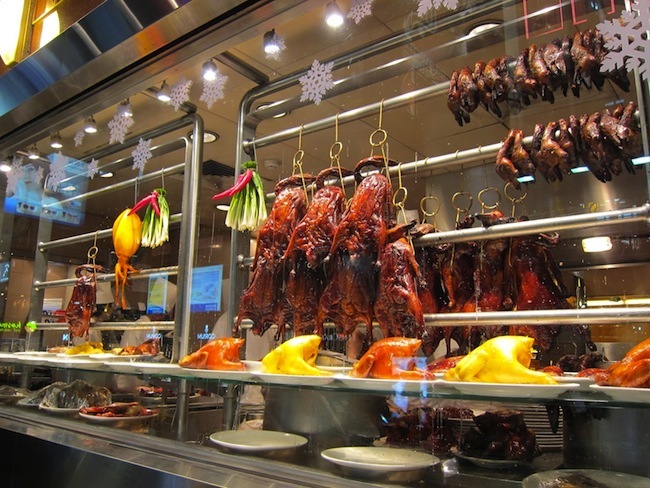 Often, as Singaporeans travel, they love to buy and bring back local products for their family and friends. But do you know what is allowed back and what is not? For example, do you know that fresh chicken eggs can only be brought back from Japan, New Zealand, and USA? Or if you are bringing plants back from your vacationing country, you need to secure certain permits and certificates before you do so? 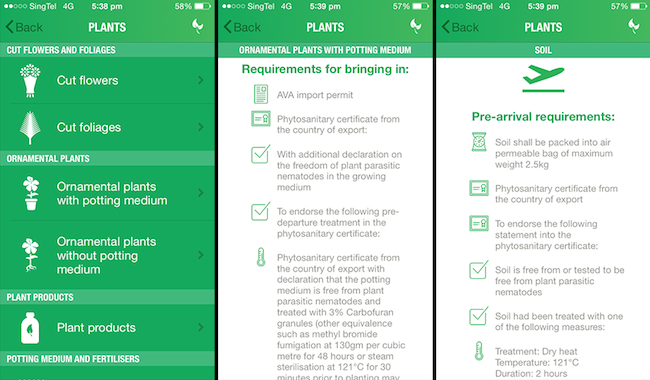 To help Singaporeans better understand the import regulations, the Agri-Food & Veterinary Authority of Singapore (AVA) has introduced SG TravelKaki, an app that provides Singaporeans important information on what they can and cannot bring back to Singapore. Also read: This web app allows you to experience world travelling as a bird! Available on both Apple and Android devices, the first thing you see on the SG TravelKaki app is a list of various categories of what travellers might be thinking of bringing back, including animals, food, dutiable goods, plants, drugs and medicine, and more. Going into the subcategories, you can then select more specific categorisations of the items. For example, in the plants category, if you are bringing back cut flowers from overseas, you are required to have an AVA permit, and the flowers you are bringing back are also subjected to a post-entry inspection by AVA. 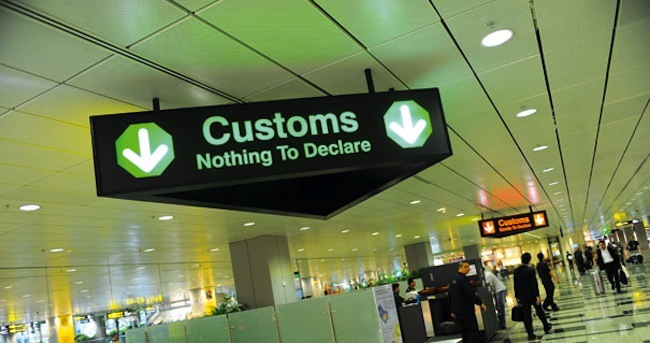 In addition, if you are bringing them back from certain countries, you would also need to possess a Phytosanitary Certificate as well, which is a health certificate for agricultural products. Confused yet? According to this article in Straits Times, many people are too. Figures from AVA have shown that in 2013, there were 670 cases of people bringing in food that they shouldn’t have. There are repercussions to doing so, as those who bring in forbidden items can be given warnings, made to pay a composition fine, or even criminally prosecuted. Overall, the app gives off a sleek feel with fluid animations, bright colours, and easily distinguishable categories. Developed by Dezainwerkz, the app only includes essential information, with unnecessary content and text eliminated to enhance user experience. 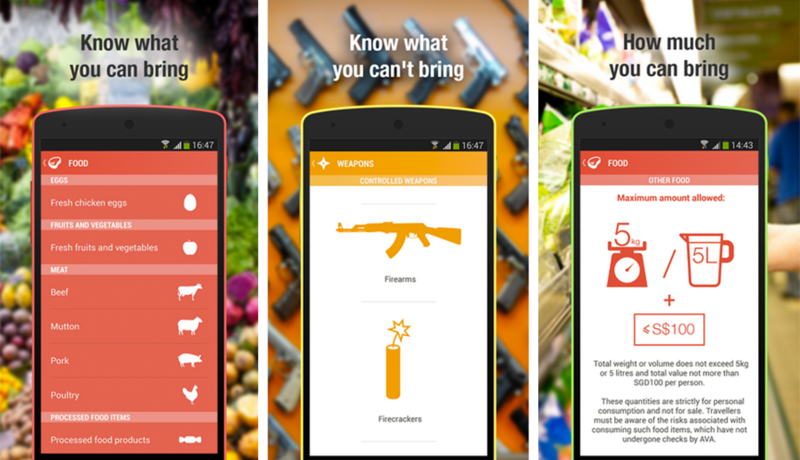 It also covers a wide range of categories, from food to weapons, ensuring that everything which is regulated is listed in the app. With each category colour coded, and useful infographics to easily illustrate important points, the interface is simple and easy to navigate. Taking up only 6.9mb, it is small enough not to be a space eater on your memory sparse smartphone or tablet. However, there are a few small downsides as well. For example, the pages themselves include links to external pages like travel notices or AVA’s online contact forms, which requires an active Internet connection to access. However, for travellers who are travelling and unable to get Internet access, these options would not be available to them while they may need it the most. Also, for those not so well-versed in these requirements, there is not a lot of explanation on how to fulfill them. For example, for those who want to bring in animals like cats and dogs, there is little description on how to get an AVA import license or to book quarantine spaces, which means they have to do further research online anyway. Travelling should be a fun experience, and it would be unwise to let your purchased goods spoil the last leg of your journey. For the average traveller who likes to bring back local food or produce every now and then, the SG TravelKaki should prove useful in helping them be mindful of their purchases. Also read: Music site Deezer continues to delight travellers, first with Jetstar and now GrabTaxi.